Ask fellow campers about "Stoddard Creek Campground" and nearby attractions. Nice forest service campground Campground host very good had a nice pull thru nice trees and shade apx 1 mile from interstate 15 would stay again. We camped at Stoddard Creek Campground in a Motorhome. Great stay. Off I15, quiet, spacious, great picnic tables. Helpful hosts. We camped at Stoddard Creek Campground in a Motorhome. 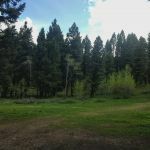 This is a USFS campground in a beautiful setting, surrounded by tall trees. Easy access on level dirt road. Pull-through sites are actually half-turns, lots of room. Picnic table and fire pits. Pit toilets. Quiet and away from traffic, just short of the Montana border. We camped at Stoddard Creek Campground in a Motorhome. Nice stop before entering Montana. Are you affiliated with Stoddard Creek Campground ?